The vessel is a custom-designed "state-of-the-art" GRP high speed planing hull Catamaran Sea Ambulance to provide medical support and transportation for patients as well as water-based emergency response. 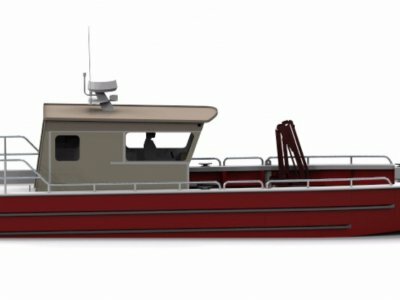 This modern response vessel is conceived to be a seaworthy, durable vessel capable of decades of superior emergency service in the often very rough waters. The proposed vessel will be able to operate in the 25+ knot range in a broader range of sea conditions than other designs of this size. 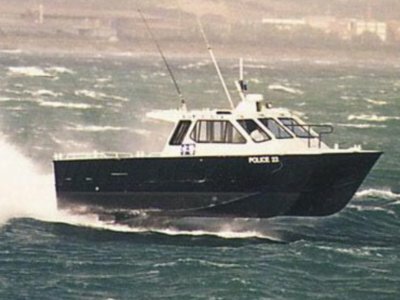 The Sea Ambulance is based on a deep-V hard chine hull Catamaran-Hull form that has been proven under offshore conditions and gives an outstandingly seaworthy craft with predictable and forgiving handling at all speeds. 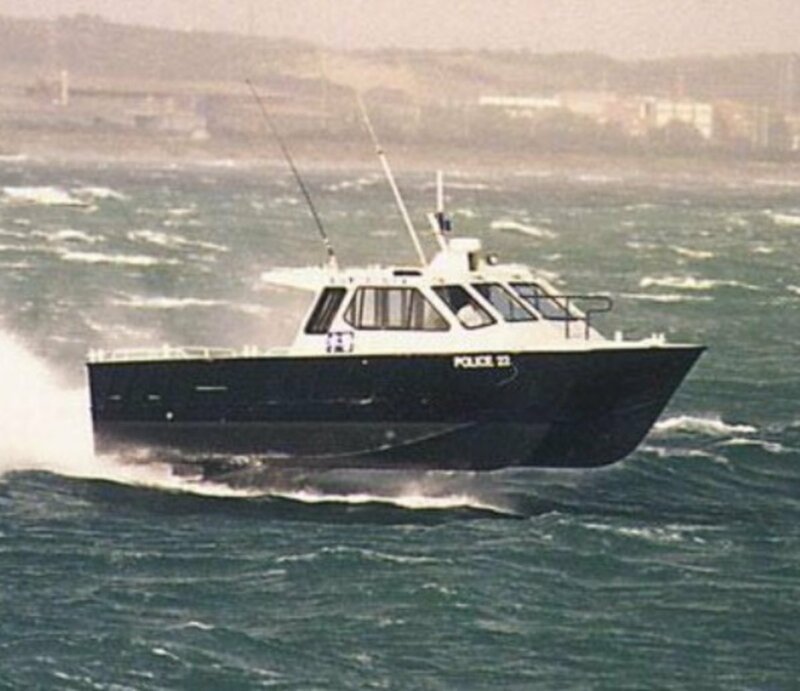 The hull is capable of handling sea state 3 at full speed whilst affording the crew reasonable comfort, as is fitting for a long range offshore craft. With a skilled helmsman the Sea Ambulance can be operated effectively in up to sea state 5 conditions. With standard production 2 x 250 HP Outboard Motors the Sea Ambulance is capable of reaching 35+ knots at a full load. 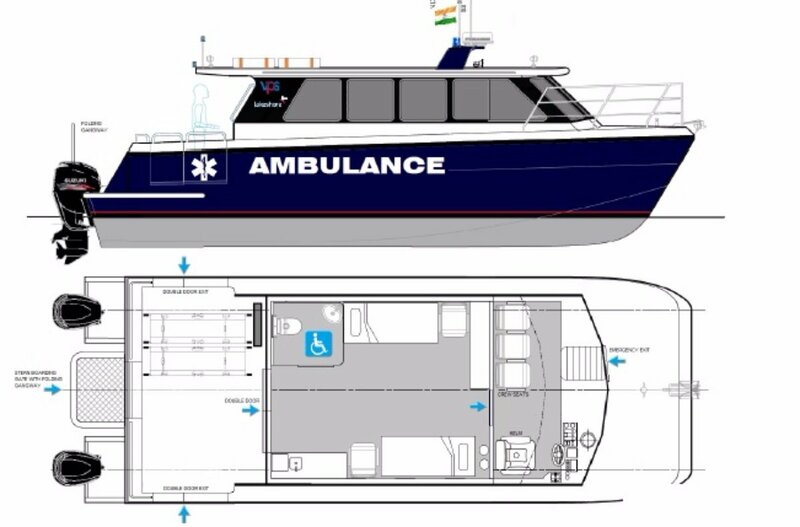 The Sea Ambulance is of closed cabin configuration and the air-conditioned main cabin/operations area provides space for 6 crew (including helm) as well as standard ambulance facilities in line with 'Type A' road ambulance requirements. A 6.6 KVA diesel generator set provides alternating current for powering the air conditioning system and also for the all-electric machinery requirements. The hull, deck and superstructure are constructed in GRP materials. The construction gives a structure of exceptional strength and is designed for speeds in excess of 40 knots with 6G accelerations. 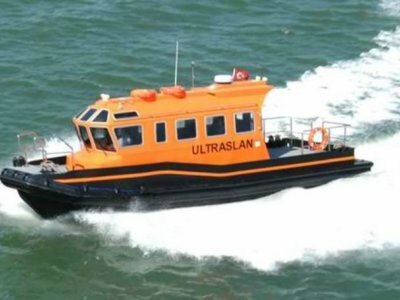 The Sea Ambulance is maximum powered by twin outboard engines (up to 250 HP each) twin Outboard Motors or twin Inboard Diesel engines coupled to waterjet propulsors / Surface Drives / Conventional Drives (FPP) or Stern Drives. The fuel is contained in fully baffled heavy-duty integral fuel tanks that have 2 separate sealed compartments. The craft is provided with four hoisting eyes allowing, with a harness, a single point crane lift. The craft is built to commercial craft standards in accordance with the quality certification of the main contractor. The boat is designed to IR Class HSLC rules and the hull will be built to comply with IR Class requirements. The craft can be operated with a two-man crew. 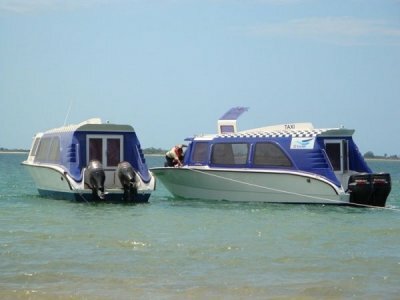 Being a twin hulled catamaran design, the vessel has exceptional capability. The design of the bow to give smooth entry thus soft ride, gives the vessel the ability to operate for long periods in choppy conditions with minimum of crew discomfort and fatigue. Tunnel and Chine design have specifically considered the sea states normally found in Indian waters. Catamaran hulls are particularly stable exceeding normal stability criteria by significant factors. The vessel has been designed to facilitate the pick-up of casualties from the water. The vessel can be provided with PARAGUARD Rescue Stretcher complete with pillow valise and 4 point helicopter lifting sling (Optional Extra). Special attention has been paid to crew comfort with Non-reclining Aircraft Style or equivalent is being provided for the Helmsman and Passengers. Instrumentation for the operation of the vessel is provided at the helmsman position with all machinery and systems monitoring instrumentation being provided for easy monitoring. Good ergonomic practice has been employed in the instrument / control layout to ensure crew efficiency is maintained in the most difficult conditions at high speed. The wheelhouse lighting for night operations is standard and fully controllable and dim-able as are the instrument lights for the ambush state. Visibility at the helmsman's position provides all-round vision. All deck areas are non-skid treated.